Which Camps Should I Attend In The Summer Of 2019? If you want to play college football, this summer should be dedicated to your craft and college recruitment. Parents, plan your vacation around camps and visits. I recommend 3-4 Chris Sailer Kicking Camps for the summer of 2019. *Attend 2 of these camps. 1 in your regional area and 1 in a different region of the United States. Why: If your invited to this camp by Chris Sailer, it is an absolute must attend. This camp is only for the very best 45 Kickers / Punters in America. Players are selected at the Las Vegas Events (January & May) + 5 Wild Cards. Why: Make no mistake about it, these are tryouts for each individual college. We recommend only 3-5 camps to ensure peak performance and to avoid injury from overuse. You will be evaluated and judged based on your “worst performance”. College coaches speak and the word spreads. By allowing proper time for rest and travel you should be able to dominate the 3-5 camps that you choose to attend. If you do well at ALL of them, you will quickly become a hot commodity. I recommend 2-3 Chris Sailer Kicking Camps for the summer of 2019. *Attend 1-2 of these camps. Attend the regional camp in your area and consider attending a regional camp in a different region of the country to begin to gain experience. Why: If you are invited to this camp by Chris Sailer, this is a MUST attend. This is will end up being THE most important Chris Sailer Kicking camp that you attend during your high school years. You will be attending with national prospects & the families of national prospects from around the United States. You will meet lifelong friends that you will compete against and lean upon for many years to come. Parents, you will meet other parents that you will build lifelong friendships with and will also lean on during the recruiting process. 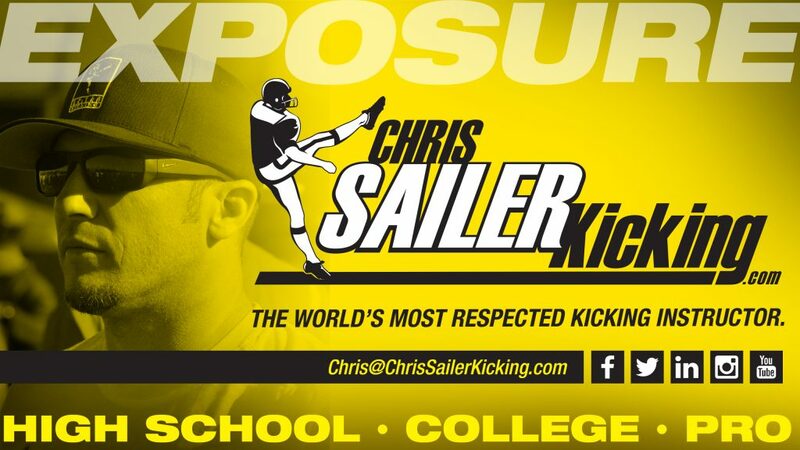 Education, Instruction, Competition, Evaluation & National Rankings with Chris Sailer Kicking. PLUS the social aspect of this camp is phenomenal. This camp will set you up for years to come. I recommend 3 Chris Sailer Kicking Camp for the summer of 2019. *Attend 1 of these camps. Attend the regional camp in your area of the county. Additional Benefits: 2 K/P’s will be selected by Chris Sailer to play in the FBU Adidas Freshman All-American Game in Naples, FL. There are so many options out there that it can become confusing. After 19 years in the business, I know the value of great instruction, the value of education, and perhaps most importantly, the value of exposure. I make choices each year to offer our clients the best possible options to achieve success. Chris Sailer Kicking remains #1 in the business for that reason. High school coaches, college coaches and NFL coaches trust in Chris Sailer Kicking. The proof is in the results. Las Vegas, TOP 12, All-American Bowl on NBC, Polynesian All-American Bowl on CBS, Underclassman Invitational, Fall / Spring / Summer 1-Day Regional Camps, FBU Youth All-American Games, Australian Scout Camps, College Training Camp & NFL Training Camps, NFL Combines, etc. Many have tried to copy the model that Chris Sailer Kicking has created, but there is a reason why we are #1 in the World. Experience, real relationships with everyone that matters in this business & the best instruction available across the world. If you want to make it as a kicker or punter… welcome to Chris Sailer Kicking. 1-Day Fall, Spring & Summer Regional Camps: These are a 1-Day Camps. Camp includes instruction, video analysis, competition, evaluation and national rankings with Chris Sailer Kicking. These are our most popular all around camps. Camps run from 8:30 – 5:00. Registration is open to ALL. Registrations are accepted on a first come, first serve basis. There is great value for all ages and skill levels. Las Vegas Prep Camps: These are a 1-Day Camps. These camps are designed to help prepare you for Las Vegas. You DO NOT have to attend the Vegas Events to attend these camps. They are a great experience either way. Camp includes instruction, competition, evaluation and national rankings. Camps run from 8:30 – 4:00. Registration is open to ALL. Registrations are accepted on a first come, first serve basis. There is great value for all ages and skill levels. Las Vegas Events: These are a 2-Day Camps. Both January & May are set up exactly the same way. Both are equally important. If you want to be the best, attend both. These are THE MOST IMPORTANT camps of the year. Camp includes instruction, competition, evaluation and national rankings. The Vegas Events off the the ultimate exposure. The Las Vegas Events are where kickers and punters are selected to attend the TOP 12 Invitation only camp. Registrations are accepted on a first come, first serve basis. There is great value for all ages and skill levels. Arrive Friday. January Event ends at 6:00 PM on Sunday. May Event ends at 3:30 PM on Sunday. Open to 8th Graders, Freshman, Sophomores, Juniors, Seniors, Junior College and 4-Year Transfers. The TOP 12 will be selected from both events (20 in January & 20 in May). Underclassmen Invitational Camp: This is a 2-Day Camp. Open to Sophomores, Freshman, 8th Graders, 7th Graders and sometimes 6th Graders. This camp is designed for both the specialists & THEIR PARENTS. Camp time is spent equally on the filed and in the classroom. This camp will educate you for years to come from A-Z when it comes to the world of kicking and punting. Camp includes instruction, competition, classroom seminars, evaluation and national rankings. This is an Invite Only camp. You will receive an invitation directly from Chris Sailer. The camp is held in Los Angeles, CA. 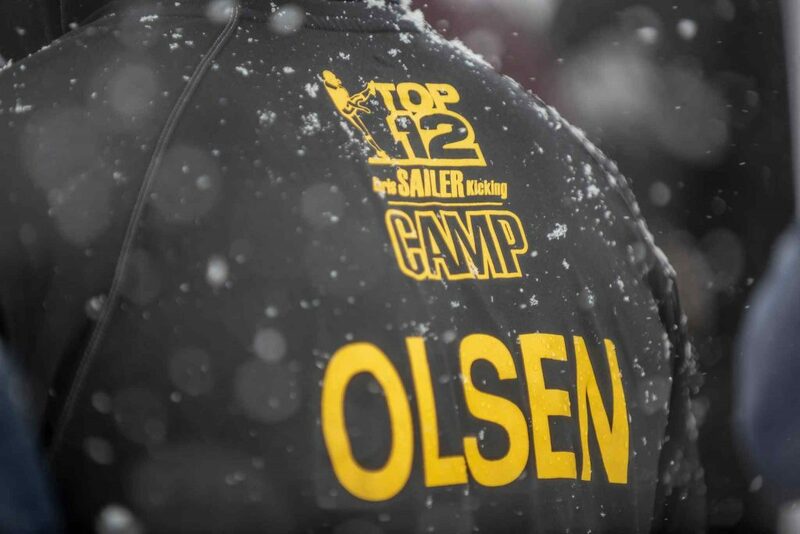 The TOP 12 Camp: This is a 2-Day Camp. This is an Invite Only Camp. The only way to get invited to this camp is to attend the Las Vegas Events. January = 20 Kickers/Punters will be selected. May = 20 additional Kickers/Punters will be selected. This camp is the best of the best. There is no other camp like this one. The TOP 12 will be selected on site during camp. This camp should be your #1 goal! Camp is held in Los Angeles, CA. College Camps: These are 1-Day Camps. These camps are run by the Universities and University coaching staffs. These camps should be seen as tryouts. This is your opportunity to be seen by the particular colleges that you select. Register for these camps through the University. 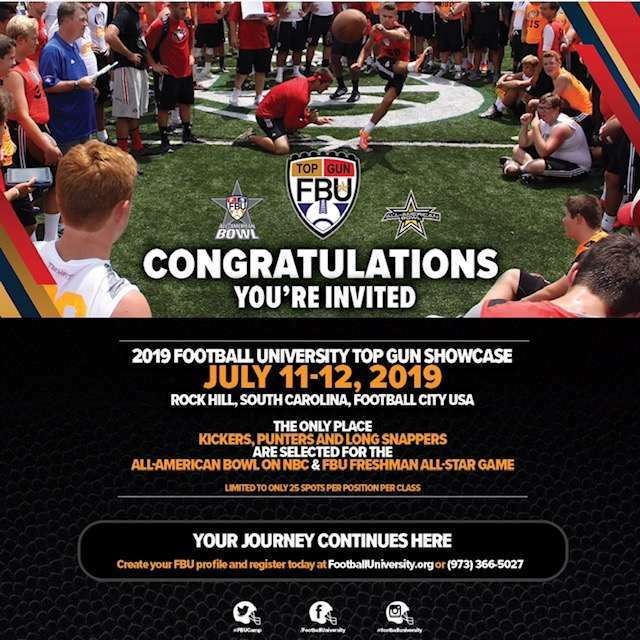 FBU TOP GUN: This is a 2-Day Camp. You must be invited by Chris Sailer. The specialists for the All-American Bowl on NBC sports (San Antonio, TX), the Polynesian All-American Bowl on CBS Sports (Oahu, HI) and the FBU Freshman All-American Bowl (Naples, FL) will be selected at this camp. Chris Sailer Kicking is an official partner of FBU, The All-American Bowl on NBC Sports, the Polynesian All-American Bowl on CBS Sports & The FBU Freshman All-America Bowl. Camps include: Exposure through FBU, the opportunity to be considered for these prestigious Bowl Games, instruction, video analysis, evaluation and national rankings. You register for this camps by calling FBU directly. I recommend attending the TOP GUN Camp every year. The All-American Bowl on NBC Sports, the Polynesian Bowl on CBS Sports, & FBU Freshman All-American Bowl participants are selected by me at this camp. When prioritizing camps, Vegas Events should always come first. All camps offer instruction, competition, evaluation and national rankings. Highlight videos are available at the 1-Day Regional Camps, Las Vegas Events and Invite Camps. Every camp has SOLD OUT for the past 14 years. Register early. This might seem like we are asking a lot of you. You are right, we are. An opportunity to play college football or perhaps in the NFL is HUGE. We will give you that opportunity. The harder you work, the more time you invest, the reality of reaching your goals will come true. It is very competitive out there. Those who work the hardest and understand the process stay one step ahead of the game. See you at a Chris Sailer Kicking camp soon! The 2019 Chris Sailer Kicking Spring Camp Tour is officially underway. Over the next 2 months 1000+ participants will attend Chris Sailer Kicking / Rubio Long Snapping camps in CA, TX, NC, GA, IL, WA, NJ, AZ & WA on the road to Vegas XXXIV (May 11-12). Instruction, competition, evaluation & national rankings will take place at each one of these camps. The ultimate goal is an invitation to the prestigious TOP 12 Camp that will take place in Los Angeles, CA on July 15-17. Sergio was outstanding on field goal on this day. He connected on 12-13 field goals to become the field goal champion. Sergio gets the ball up well and easily has 50+ yard range. He is developing into a top junior college kicking prospect for the upcoming season. The tools are all there to take his game to the next level. Hunter won his third consecutive Chris Sailer Kicking IL Punting Championship. He did an outstanding job punting the football in poor conditions. He easily averages 40+ yards with 4.4+ hang time. He is one of the most consistent performers in the country that continues to prove he is a D1 level recruit. Look for Hunter to have a big 2019 off season impressing college coaches around America. Jack Olsen is a sure fire D1 scholarship pick! Leo Capparelli is developing well! The 2019 Chris Sailer Kicking Spring Camp Tour will continue in Atlanta, GA (Sunday April 28) & Vegas XXXIV in Las Vegas, NV (May 11-12, 2019). Vegas XXXIV is less than a month away! 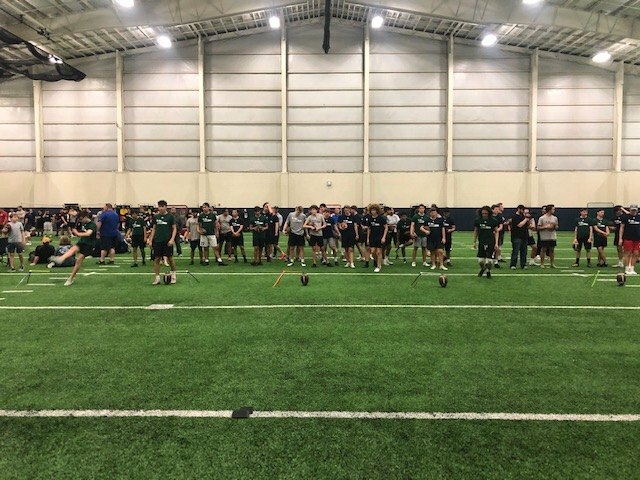 2019 TX Spring Camp Recap – Joseph McFadden Comes Out On Top! The Road to Vegas XXXIV continued April 7th with a stop in Dallas, TX. Dallas, the state of Texas and the southern region of the country always produce incredible talent. From Justin Tucker, to Dan Bailey, to Randy Bullock… Who will be next? Take a look at a few hopefuls. Here are the results. The 2019 TX Spring Camp was loaded with talent! The long time Chris Sailer Kicking kicker continues to prove that he is an absolute standout. He went 8-8 with a long of 55 yards to win a major field goal competition. He hits a big time D1 ball off the ground. His ball gets up quick and he has 60+ yard range. His kickoffs are strong. Joseph averages 65+ yards with 4.0+ hang time. He is also a very capable punter. This 5-Star Kicker is a sure fire D1 Scholarship Pick. OFFER NOW!!! 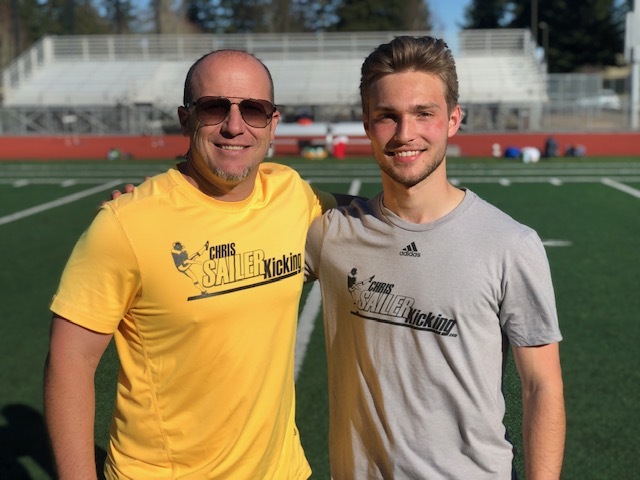 Nathan had his best performance at a Chris Sailer Kicking camp yet. He is a phenomenal athlete that is really starting to come into his own as a Kicker. Nathan won a major field goal competition by going a remarkable 9-9, including 4 field goals of 50+ yards. His kickoffs are strong, near the top of his class. Nathan continues to elevate his game and is beginning to cement himself among the elite in America. Big things ahead… stay tuned. David recently became a Chris Sailer Kicking 5-Star Kicker with his huge performance at Vegas XXXIII in January. He was equally impressive in Dallas. David has been attempting CSK Camps since his 8th grade year. He is mentally and physically strong and mature beyond his years. He won the kickoff competition by averaging 65+ yards, with 4.0+ hang time. His best ball measured 72 yards with 4.05 second hang time. He is ready for whatever challenge comes his way. Reis is quickly becoming one of the most decorated punters in Chris Sailer Kicking history. He was a national champion kicker and punter at the 2018 Underclassmen Invitational. He followed that up by winning another championship (Punting) on the biggest stage at Vegas XXXIII this past January. On this day he won the major punting competition by averaging 45+ yards, with 4.5+ second hang time. Reis is also a D1 talent as a kicker. He competed extremely well at every position in Dallas. He is a major D1 recruit… OFFER NOW!!! Class of 2019/JC Standouts: Gino Garcia, Daniel Esparza, Jared DeFelice. Class of 2020 Standouts: Reis Vernon, Tabor Allen, Tanner Cragun, Carson Roberts, Connor Wallace, Aidan Clark, Aidan Schiefer, Arturo Ramirez, Carlos Villagomez, JC Smith, John Hoyland, Nico Ledesma, Rich McDermott, Anthony Raya, Connor Crookham, Evanston, Garneau, Huxley Richardson, Riley Nuzzo, Marco Rodriguez, Victor Robles, Wesley Winters. Class of 2021 Standouts: Joseph McFadden, David Kemp, Nathan Ellisor, Bert Auburn, Aaron Wagaman, Matthew Eich, Francisco Castillo, Ethan Spearman, Ty Reid, Joshua Levin, Brandon Garcia, Colton Batten, Joshua McCormick, Sergio Rubio. Class of 2022 Standouts: Carter Brown, Markus Merkelbach, Bradyn Ritchie, Brynden Southworth, Upton Bellenfant, Brody McNew, Michael James. 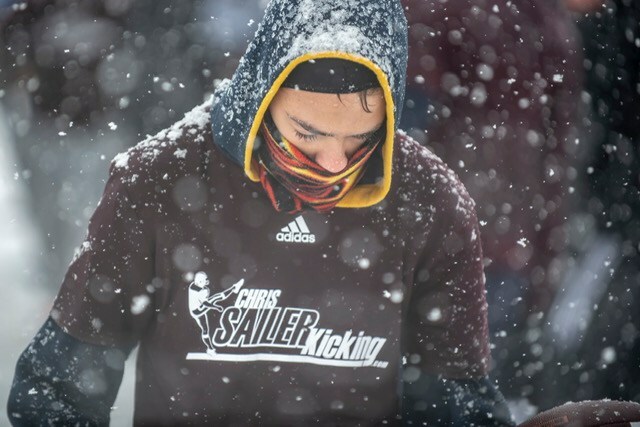 The 2019 Chris Sailer Kicking Spring Camp Tour will continue Chicago, IL (Sunday April 14), Atlanta, GA (Sunday April 28) & Vegas XXXIV in Las Vegas, NV (May 11-12, 2019). 2019 AZ Spring Camp Recap – Omar Vasquez Wins It! This was Omar’s first Chris Sailer camp of his career. Omar showed great progress from the morning to the afternoon as he won the field goal charting competition with a 50 yarder. He battled in the afternoon against Nick Hill and Fabien Guillen to take the title of Camp Champ! Nick Hill continues to impress in AZ as he always seems to be in the finals of all competitions. Nick had an impressive day on both field goal and punt as he won a major field goal competition by going 7 for 7 with a long of 53 yards. Nick was also had a good day kicking off. With hard work on his punting technique, he has the strength to develop into a good college level punter as well. Fabien had a great showing in AZ as he hit multiple punts over 40 yards with over 4.7 seconds of hang time. He outlasted Clay Gross in the Punt Final. Fabien is a fierce competitor who is ready to make an impact on the college level. Look for him to have a big showing at Vegas XXXIV. Carson is another rising star coming out of Arizona that has big time potential. He is a big, tall, strong and athletic kicker who is hits big time kickoffs, typically deep in the end zone. With continued hard work on his technique and consistency, Carson will be ranked towards the top of his class. Class of 2019/JC Standouts: Zachary Grabovic. Class of 2020 Standouts: Carson Zilmer, Clay Gross Dominic Chakraborty, Dominic Persi, Fabien Guillen, Jansen Malvick, Mark Vargas, Nick Hill, Omar Vasquez, Santiago Garcia-Mendez. 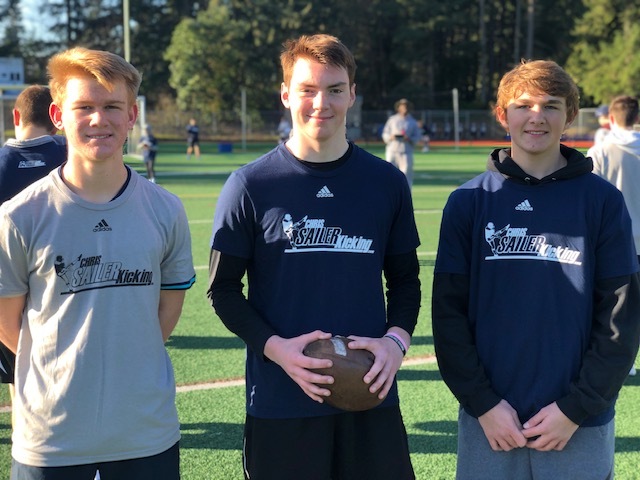 Class of 2021 Standouts: Crew Peterman, Maximus Kennedy, Richie Brutto, Ryan Feinberg. Class of 2022 Standouts: Casey Kautzman, Grady Gross. 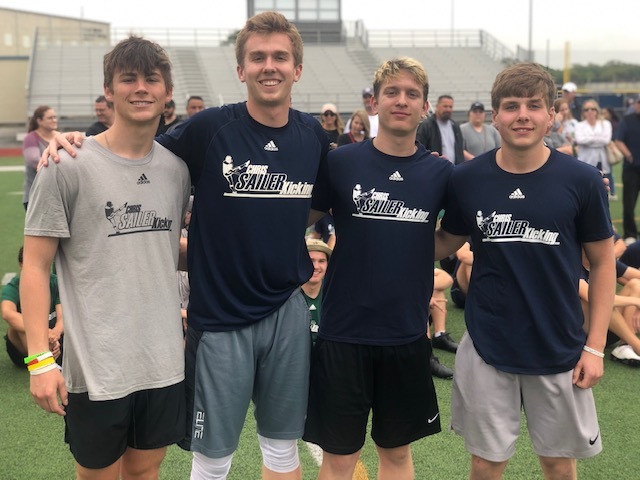 The 2019 Chris Sailer Kicking Spring Camp Tour will continue in Dallas, TX (Sunday April 7), Chicago, IL (Sunday April 14), Atlanta, GA (Sunday April 28) & Vegas XXXIV in Las Vegas, NV (May 11-12, 2019). See you in Vegas, where the best of the best prove it! 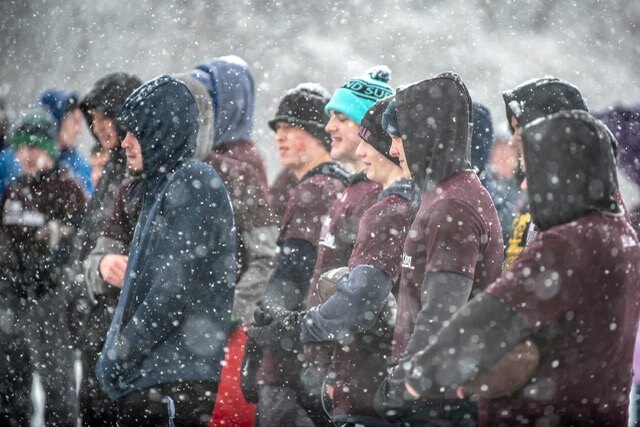 2019 NJ Spring Camp Recap – Aidan Clark Does it AGAIN! Aidan looked strong all day showing great consistency and growth as a combo prospect. He won both the last man standing field goal competition and the major punting competition. He was smooth and accurate on field goal and connected from 50+ yards out. His best punt measured 45 yards with 4.4 hang time. He also drove the ball into the end zone on kickoff. Aidan is proving that he will be successful at the next level. Spencer was far and away one of the most consistent kickoff guys at the camp. He averaged 60+ yards with 3.7 to 3.9 hang times. He also had a solid day kicking field goals displaying range of 50+ yards. 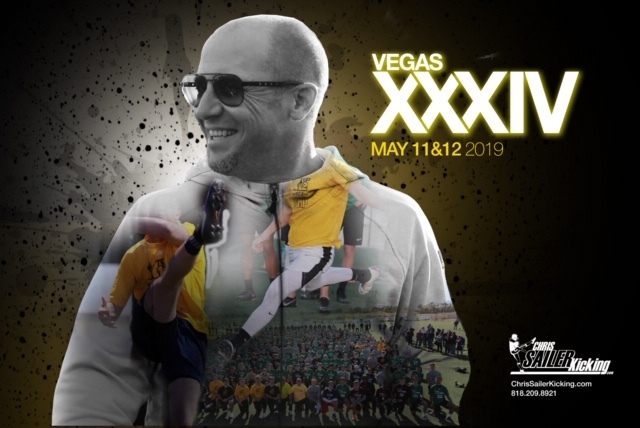 Look for Spencer to compete with the best of the best at Vegas XXXIV in May. Spencer has a bright future. The 2019 Chris Sailer Kicking Spring Camp Tour will continue in Phoenix, AZ (Sunday March 31), Polynesian Bowl Combine in Las Vegas, NV (Sunday March 31), Dallas, TX (Sunday April 7), Chicago, IL (Sunday April 14), Atlanta, GA (Sunday April 28) & Vegas XXXIV in Las Vegas, NV (May 11-12, 2019). Do you have what it takes to make TOP 12? See you in Vegas…. 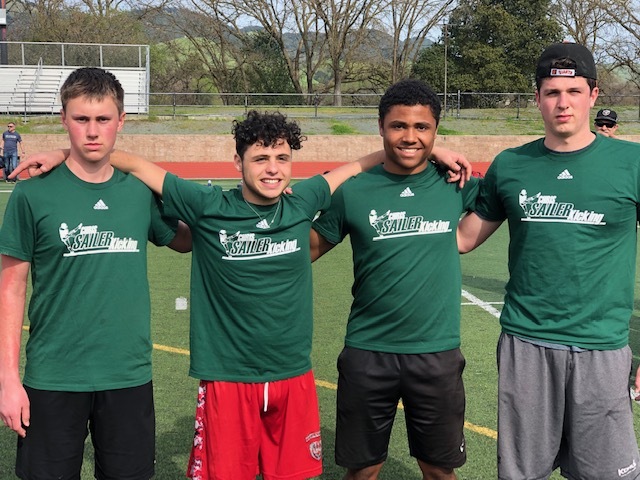 2019 Nor Cal Spring Camp Recap – Jackson Foster Dominates! Jackson continued his great punting display from a stellar Vegas performance. In the morning session, Jackson was consistently hitting punts 45-55 yards with 4.3+ hang time. His smooth footwork and tall, athletic frame make his potential and ceiling extremely high. During the afternoon competitions, Jackson turned it up another notch and hit several balls 55+ yards with 4.9+ hang time. He hit back to back 55 yard 4.6s hang time punts to win the final camp champion competition! The long time Chris Sailer Kicking student was once again extremely consistent and accurate. Micah won the charting competition and showed the most consistency on field goals throughout the day. He hit many kicks of 50+ yards. He was also very strong on punts throughout the day and competed very well there. Look for Micah to make his college decision soon and to be playing on Saturdays in the fall. Hunter won the last man standing field goal competition. He was very smooth and consistent all day. Hunter gets great height on his ball and hit several kicks of 50+ yards. Hunter also showed very strong potential on kickoffs and with improvement there can become a top kicker in his class. 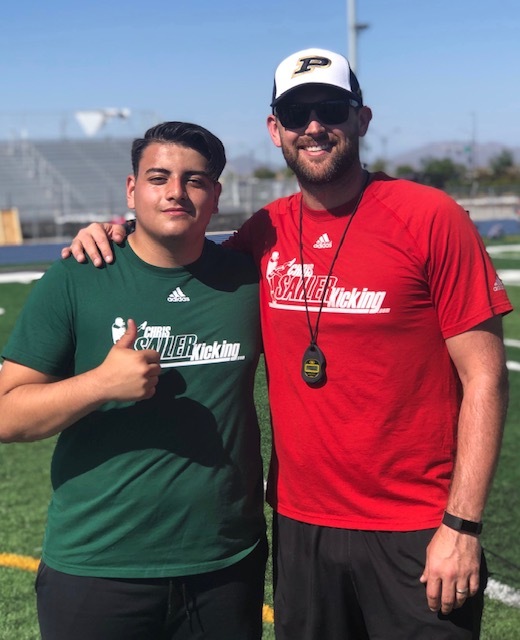 Dante came out of nowhere at the Vegas prep camp earlier this year and immediately established himself as a strong, athletic and potentially dominant 2020 kicker. During kickoff, Dante absolutely smashed the ball and his best ball was 70 yards with 4.1 hang time which won him the competition. He also showed well on field goal and hit several kicks over 55 yards. With continued development Dante is going to be special at the next level. Do you have what it takes to make TOP 12? 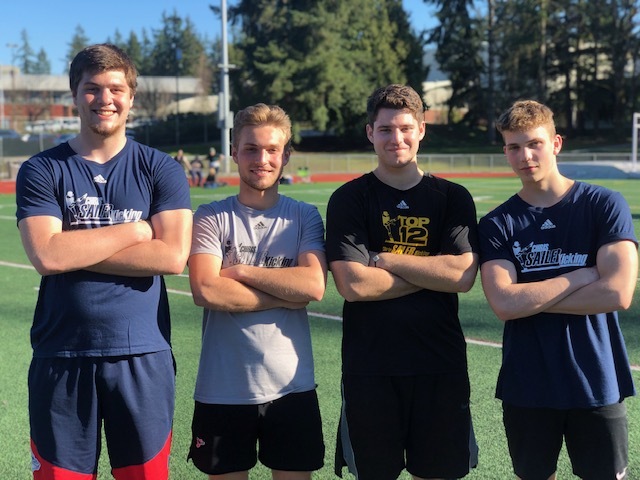 2019 WA Spring Camp Recap – Connor Davis Steps Up! Connor had by far his best showing to date at a at a Chris Sailer Kicking camp. He confidence and skill level grows each time we see him. He won the Kickoff Competition by averaging 60+ yards with 3.6+ hang time. He then came through big time in the finals round nailing 4-5 field goals from 47+ yards out. Connor is a great athlete that is developing into a fantastic high school kicking prospect. The long time Chris Sailer Kicking student was once again dominant. The 2-Time TOP 12 Camp Invitee won a major field goal competition by going 7-7 with a long of 55 yards. He was excellent on kickoffs averaging 65+ yards with 3.9+ hang time. Kyle is also a very capable punter. He is beyond ready for the next level. I expect Kyle to not only start next year, but also challenge for major honors. Dawson had an outstanding camp for his first Chris Sailer Kicking event. He is a great looking athlete with a live leg. He won a major field goal competition by going 6-6 with a long of 52 yards. Dawson was also strong on kickoffs. His best ball measured 70 yards with 3.5 hang time. Dawson has excellent natural ability and is just beginning his journey. He is ready for the challenge of college football. Tanner is big, tall, strong and athletic. He has an ideal frame for a college level punter. When he connects, he hits a fantastic ball. His best ball on the day measured 45+ yards with 4.6+ hang time. His potential and upside are obvious. With continued hard work on his technique and consistency, he could be a great one. I look forward to seeing him compete with the best of the best at Vegas XXXIV. Class of 2019/JC Standouts: Kyle Sentkowski, Dawson Hodge, Tristan Lewis, Asa Kempton, Griffin Cummins. Class of 2020 Standouts: Connor Davis, Tanner Nicklas, Blake Glessner, Daniel Yoon, Garrett Craig, Jacob Hausserman, Nick Hill, Joshua Villarino, Ryan Curran, Dillon Crowell, John Hoyland, Gabe Uribe, Liam Sweeney, Luke Mehlschau, Nick Bovenkamp, Daniel Mood. Class of 2021 Standouts: Connor Mantelli, Gavin Dalziel, Jack McCallister, Jarrett North, James Werth, Thomas Southey, Henry Osmer, Charlie Townsend, Jack White, Kealan Hawk, Michael Goforth. Class of 2022 Standouts: Ethan Moczulski, Wyatt Redding, Soren McKee, Carson Russell, Connor Ridenour, Marcus Merkelbach, Ryan Beightol. Future Stars: Troy Petz, Van Berman, True Dickson, Max Stephenson. 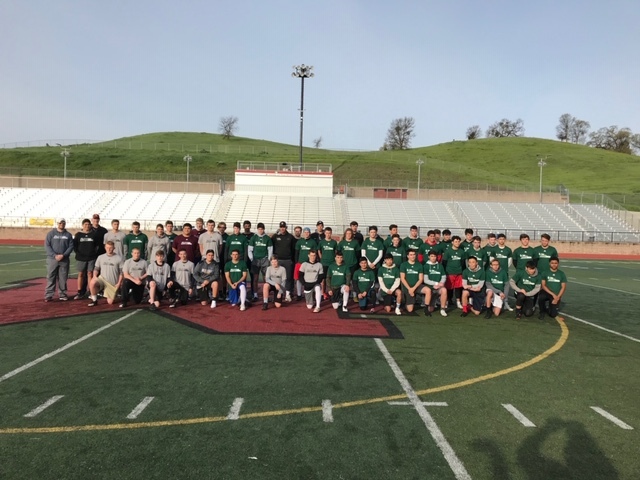 The 2019 Chris Sailer Kicking Spring Camp Tour will continue in Waldwick, NJ (Sunday March 24), San Francisco, CA (Sunday March 24), Phoenix, AZ (Sunday March 31), Polynesian Bowl Combine in Las Vegas, NV (Sunday March 31), Dallas, TX (Sunday April 7), Chicago, IL (Sunday April 14), Atlanta, GA (Sunday April 28) & Vegas XXXIV in Las Vegas, NV (May 11-12, 2019). So You Didn’t Make TOP 12, What Now? For the past few weeks, you have been waiting anxiously to see if you were going to be selected to the TOP 12 Camp. When the first 20 selections were announced, 20 kickers / punters were ecstatic. Hundreds of others were upset, frustrated, angry, etc…. rightfully so. As athletes and competitors the desire to succeed should run deep. Couple ways to look at it…. You can be upset with me for not selecting you. You can be upset with yourself for not performing when it counted. You can even find a way to blame others, but, it is ultimately on you. The only thing you can control is how hard and smart you work. Everyone in Vegas is competing for the same spots. Don’t let anybody outwork you and you will see different results. At Vegas XXXIV, I will choose 20 additional TOP 12 Camp Invitees. They will join the first 20 selected at the Invite Only TOP 12 Camp this summer. This is a true invite only camp. I do NOT just hand out invites to get people to come to it. That would give me no credibility. I choose the best because they are the best. They will represent the TOP 12 and Chris Sailer Kicking forever. Are you one of them? Time to decide. Prove to me, and the rest of the world, that you belong. Or don’t. THE CHOICE IS YOURS….. Introducing the First 20 2019 TOP 12 Camp Invitees! Well over 500 specialists attended Vegas XXXIII January 19-20, 2019. Talent from over 40 states and 3 countries attended the most popular camp in the world for Kickers, Punters & Long Snappers. The 33rd event in Las Vegas was a tremendous success. As always the #1 goal of all recruits in attendance is to make the prestigious exposure list known as the TOP 12. Here are just a few names that are part of this exclusive fraternity… Justin Tucker, Dan Bailey, JK Scott, Bryan Anger, Ryan Allen, Ryan Succop, Kai Forbath, Tress Way, Bradley Pinion, Logan Cooke, Randy Bullock, Ka’imi Fairbairn, Cody Parkey, Dustin Hopkins, Blair Walsh, Colby Wadman. The list goes on and on. Vegas XXXIII Accomplishments: Class of 2020 Kickoff Champion, hit a 75 yard 4.04 kickoff Saturday. Past Chris Sailer Kicking Camp Accomplishments: 2017 Underclassmen Invitational Class of 2020 Kickoff Champion, 2017 Underclassmen Invitational Class of 2020 Field Goal Last Man Standing Champion, 2018 TX Summer Camp Kickoff Champion, 2018 TX Summer Camp Overall Champion. Vegas XXXIII Accomplishments: Saturday Last Man Standing Punting Champion, Junior College/Transfer Punting Champion, Punt Competition Finalist. 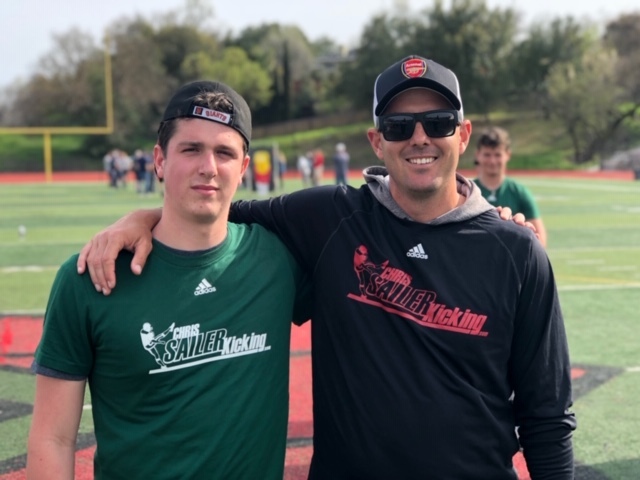 Past Chris Sailer Kicking Camp Accomplishments: Hit multiple 5.0+ hang time punts at the 2018 CA Fall Camp. Vegas XXXIII Accomplishments: Finished 3rd in the Kickoff Competition. Hit multiple 70+ 4.0+ kickoffs Saturday. Hits one of the cleanest balls off the ground on field goal and gets more height on his ball than anyone in the country. Past Chris Sailer Kicking Camp Accomplishments: 2018 Vegas XXXI Class of 2021 Field Goal Last Man Standing Champion, 2018 Vegas XXXI Class of 2021 Kickoff Champion, 2018 Vegas XXXI Class of 2021 Punt Champion, 2018 Vegas XXXII Class of 2021 Kickoff Champion, 2018 Underclassmen Invitational Class of 2021 Punt Champion, 2018 Underclassmen Invitational Field Goal Finalist, 2018 Underclassmen Invitational Overall Field Goal Champion, 2018 TOP 12 Camp Invitee. Vegas XXXIII Accomplishments: Hit multiple 70+ 4.0+ kickoffs Saturday, Nailed a 53 yard pressure field goal to earn TOP 12 Spot, Finished 7th Kickoff Competition, Finished 5th Field Goal Competition, Field Goal Finalist. Past Chris Sailer Kicking Accomplishments: Was a star at youth camps. Currently holds scholarship offers from: Offers: Arizona, Arizona State, CAL, Iowa State, Utah, Memphis, San Diego State, Harvard, Princeton, Yale, Air Force, Northern Arizona, Southern Utah. Vegas XXXIII Accomplishments: Saturday Group 2 (Class of 2020) Field Goal Last Man Standing Champion, Finished 10th Kickoff Competition. Past Chris Sailer Kicking Accomplishments: 2017 Vegas XXIX Class of 2020 Field Goal Champion, 2017 Vegas XXIX Class of 2020 Punt Champion, 2017 NC Summer Camp Field Goal Champion, 2018 Vegas XXXII Punt Finalist, 2018 TOP 12 Camp Invitee, 2018 TOP 12 Day 1 Class of 2020 Field Goal Champion, 2018 TOP 12 Day 1 Field Goal Champion. Vegas XXXIII Accomplishments: Hit multiple 70+ 4.0+ Kickoffs Saturday, Hits one of the cleanest field goals in the nation. Past Chris Sailer Kicking Accomplishments: 2018 Vegas XXXI Field Goal Finalist, 2018 Vegas XXXI Punt Finalist, 2018 TOP 12 Camp Invitee, 2018 TOP 12 Camp Day 1 Field Goal Champion, 2018 TOP 12 Selection. Vegas XXXIII Accomplishments: Hit multiple 70+ 4.0+ kickoffs Saturday, Hit a 66, 3.89 Kickoff Sunday, Hits one of the cleanest field goals off the ground in America. 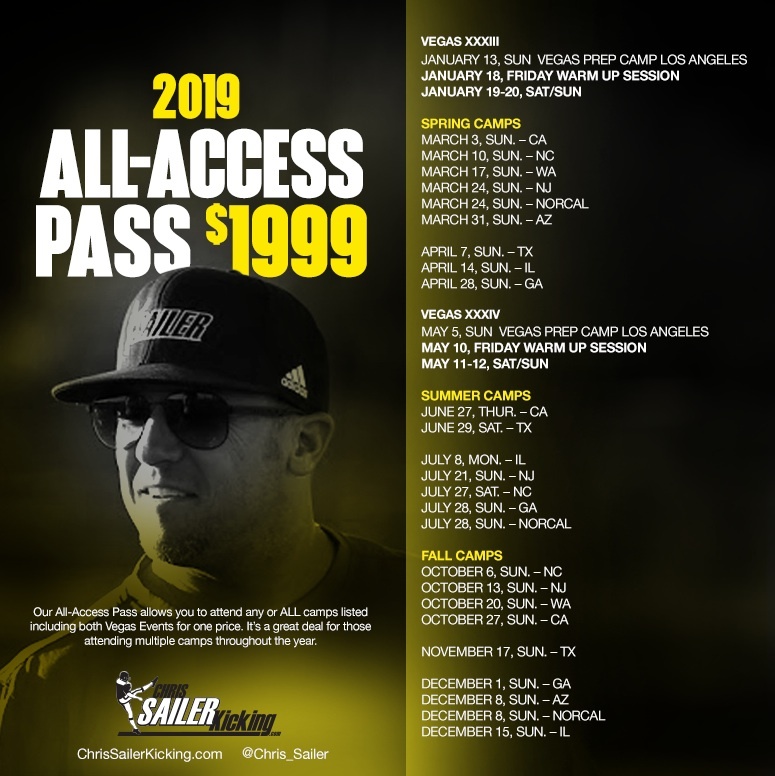 Past Chris Sailer Kicking Accomplishments: 2018 CA Spring Camp Field Goal Champion, 2018 Vegas XXXII Class of 2020 Kickoff Champion, 2018 Vegas XXXII Field Goal Finalist, 2018 TOP 12 Camp Invitee, 2018 TOP 12 Camp Class of 2020 Kickoff Champion. Vegas XXXIII Accomplishments: National Kicking Champion, Class of 2021 Field Goal Champion, Field Goal Finalist, Punt Finalist. Past Chris Sailer Kicking Accomplishments: Tremendous performance at the 2018 GA Fall Camp. Vegas XXXIII Accomplishments: Finished 13th Kickoff Competition, Finished 16th Punt Competition, Finished 5th Field Goal Competition, Field Goal Finalist. Past Chris Sailer Kicking Accomplishments: 2018 Vegas XXXII Field Goal Finalist, 2018 GA Fall Camp Field Goal Champion, 2018 GA Fall Camp Overall Champion. Vegas XXXIII Accomplishments: Hit multiple 70+ 4.0+ Kickoffs Saturday, Finished 5th Field Goal Competition, Field Goal Finalist. Past Chris Sailer Kicking Accomplishments: 2018 Vegas XXXII Class of 2020 Punt Champion, 2018 Vegas XXXII Punt Finalist, 2018 Underclassmen Invitational Class of 2020 Kickoff Champion. Vegas XXXIII Accomplishments: Saturday Group 1 (Class of 2021) Field Goal Last Man Standing Competition Champion, Finished 4th Kickoff Competition, Class of 2021 Punt Champion, Punt Finalist (Final 4). Past Chris Sailer Kicking Accomplishments: Tremendous performance at the 2018 NC Summer Camp earning him the #1 Punting Ranking in the nation. Vegas XXXIII Accomplishments: Hit multiple 70+ 4.0+ Kickoffs Saturday, 2nd Place Kickoff Competition, 9th Place Punting Competition, Punt Finalist. 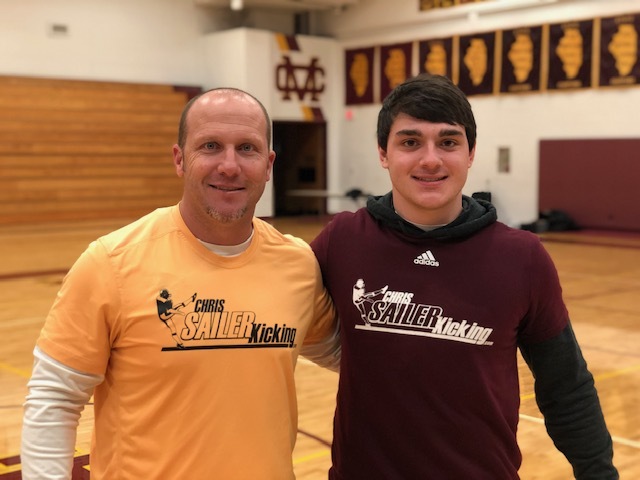 Past Chris Sailer Kicking Accomplishments: 2018 TOP 12 Camp Invitee, 2018 IL Summer Camp Kickoff Champion, 2019 Chris Sailer Kicking 3rd Team All-American, Holds scholarship offers from: Miami (OH), Illinois State. Vegas XXXIII Accomplishments: Hit Multiple 70+ 4.0+ Kickoffs Saturday, 4th Place Kickoff Competition, Class of 2020 Punt Champion, Punt Finalist. Past Chris Sailer Kicking Accomplishments: Tremendous performance at GA Fall Camp earning him top 10 national ranking as a Kicker & Punter. Vegas XXXIII Accomplishments: Hit multiple 70+ 4.0+ Kickoffs Saturday, Scored a 10 on Field Goal, Hits the biggest ball on Field Goal off the ground in the Class of 2020. Past Chris Sailer Kicking Accomplishments: #1 Kicker in the nation. 2018 TOP 12 Camp Invitee, 2018 TOP 12 Field Goal Last Man Standing Champion, 2018 TOP 12 Selection. Vegas XXXIII Accomplishments: 5th Place Punting Competition, Punt Finalist, Hit a 4.9 Punt Saturday, Hit the biggest kickoff (Class of 2020) of the day Saturday 70+ 4.26, Hits one of the best D1 balls off the ground on Field Goal in America. Past Chris Sailer Kicking Accomplishments: Tremendous performance at the 2018 TX Fall Camp earning him top national Kicking & Punting rankings. Vegas XXXIII Accomplishments: Hit several 70+ 4.0+ Kickoffs Saturday, Hit a 68 yard 3.84 Kickoff Sunday, Hits one of the cleanest ball off the ground on Field Goal in the nation. Vegas XXXIII Accomplishments: Saturday Group 4 (Class of 2020) Field Goal Last Man Standing Champion, 8th Place Kickoff Competition, 7th Place Punting Competition, 5th Place Field Goal Competition, Field Goal Finalist, Punt Finalist. 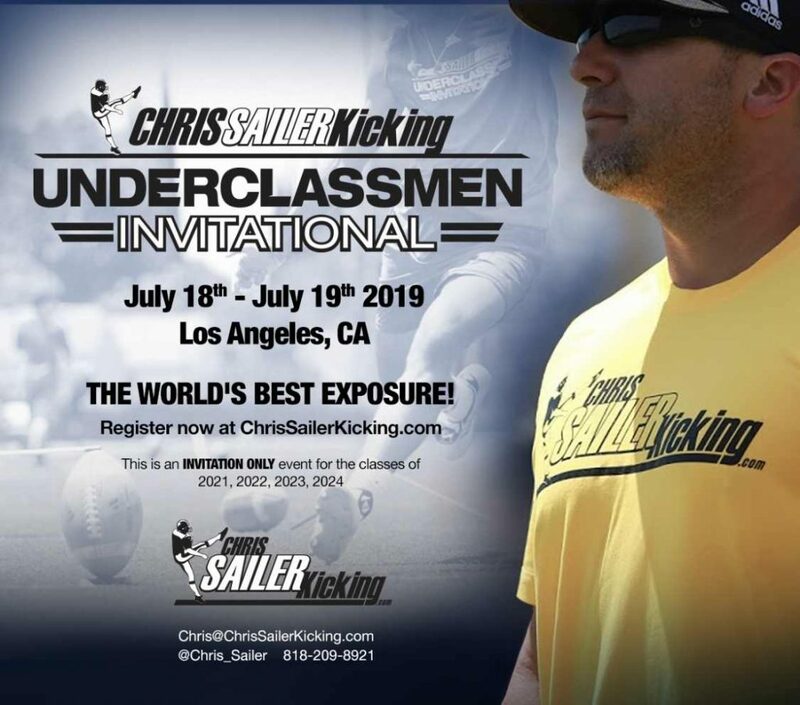 Past Chris Sailer Kicking Accomplishments: Selected by Chris Sailer Kicking for the 2016 Class of 2020 FBU All-American Game, 2015 FBU Atlanta Youth MVP, 2016 Chris Sailer Kicking Most Improved Award (Class of 2020), 2017 Vegas XXIX Class of 2020 Kickoff Champion, 2018 Chris Sailer Kicking 1st Team All-American, Hold Scholarship offers from: South Alabama, Tennessee Chattanooga. Vegas XXXIII Accomplishments: National Punting Champion, 3rd Place Punting Competition, Punt Finalist. Past Chris Sailer Kicking Accomplishments: 2018 Underclassmen Invitational Day 1 Field Goal Champion, 2018 Underclassmen Invitational Day 1 Punt Champion, 2018 Underclassmen Invitational Overall Punt Champion. Vegas XXXIII Accomplishments: Nailed a 53 yard pressure field goal to earn TOP 12 Spot, Hit multiple 70+ 4.0+ Kickoffs Saturday, Finished 16th Kickoff Competition, Hit 67 Yard 4.03 Kickoff Sunday. Past Chris Sailer Kicking Accomplishments: 2017 Vegas XXIX Class of 2020 Field Goal Champion, 2018 Vegas XXXI Class of 2020 Field Goal Champion, 2018 Vegas XXXI Field Goal Finalist, 2018 IL Fall Camp Field Goal Champion. Vegas XXXIII Accomplishments: Class of 2020 Punt Champion, Punt Finalist (Final 4), Hit multiple 70+ 4.0+ Kickoffs Saturday. Past Chris Sailer Kicking Accomplishments: 2017 GA Summer Camp Field Goal Champion, 2017 GA Summer Camp Overall Champion, 2017 Underclassmen Invitational Punt Finalist, 2017 GA Fall Camp Field Goal Champion, 2018 Vegas XXXI Class of 2020 Field Goal Champion, 2018 Vegas XXXI Field Goal Finalist, 2018 Vegas XXXI Class of 2020 Punt Champion, 2018 Vegas XXXI Punt Finalist, 2018 TOP 12 Camp Invitee, 2018 GA Summer Camp Field Goal Champion, 2018 GA Summer Camp Overall Champion.These 20 Kickers / Punters are clearly well deserving of the honor of being selected to attend the 2019 TOP 12 Camp. They should be commended on their accomplishments. I understand that many other tremendous kicking and punting specialists in attendance were also deserving and can state their case as to why they are deserving over the first 20 selected. In the end, as always explained, these choices were made based on several factors and ultimately the decision of Chris Sailer. Are you disappointed that you weren’t selected? There are two ways to go about it. You can either 1). Complain, quit and blame others for the decision, or 2). Continue to work harder than ever getting ready for Vegas XXXIV (May 11-12, 2019) and prove that you belong among the elite. Chris Sailer Kicking will select 20 more Kickers / Punters to attend the TOP 12 Camp at Vegas XXXIII. See you soon at the greatest camp on earth…. Vegas. I am a Junior, and it is March! Chris Sailer Kicking is the #1 Kicking, Punting and Long Snapping Camp in the World.